Automatic garage doors are no longer just a luxury, they are a necessity that offer safety and convenience to homeowners and businesses alike. Though many were skeptical when these devices were first introduced to the market - more than 90 years ago, today they have become increasingly popular and affordable. If you're considering installing a new garage door, call the team at H&O Garage Doors. H&O proudly serves customers in Queens, Brooklyn, The Bronx, Manhattan, and Nassau and Suffolk Counties. Our highly skilled technicians offer sales and consultations and will help you choose from a wide selection of door styles, including wood, carriage and metal doors. At H&O we rely on state-of-the-art equipment and provide each customer with cost-effective, prompt and efficient service unmatched by our competitors. We've earned a reputation for quality, honesty and dependability, and our prices can't be beat (see our price list). There are a number of benefits to having an automatic garage door, starting with the ease and convenience of not having to lift a manual door. Also, opening a door remotely avoids potential injuries that can occur when individuals, especially the elderly and young children, come into contact with a manual door. In addition, using a door opener device allows you to remain in your vehicle, which is quite helpful if you are carrying packages or if the weather conditions are poor. Lastly, an automatic garage door acts as a security system that will protect you from burglaries, robberies and other home invasions. 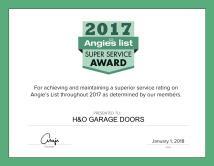 When you call H&O Garage Doors, you'll receive a superior level of personal service. Once your new automatic garage door is installed, you'll also have peace of mind knowing that you can enter or leave your residence or business location in comfort and safety. Our service doesn't stop there. We also offer a full maintenance package that includes repairs, inspections and tune-ups. While automatic garage doors require far less upkeep than manual doors, these are mechanical devices that depend on springs, tracks, rollers, electronic panels and remote controls. If any of your features need to be serviced, we are readily available for rapid repairs. Unlike our competitors, we don't wait for something to go wrong, and leave you at the mercy of a stuck door, a broken panel or defective remote control. We conduct regular inspections to ensure your automatic garage door system is functioning properly and perform any necessary tune ups. Through the years, Operation Manager Mordi Ifrach has proudly served countless satisfied customers in the greater New York City area and Long Island. For all of your automatic garage door needs, call H&O Garage Doors at (718) 710-6468 today.